Just want to share my first time to join a running event. I used to run at least 5 times a week, but that was two years ago. I have not really maintained a steady fitness program. As I mentioned in my welcome note, it has been an on and off thing. For once I weighed 204 lbs, and then started to realize that I don’t feel good. I was not comfortable with my weight so I decided to run and get a work out plan and managed to trim down to 175 lbs and felt good. However, I suddenly stopped running and going to the gym for a very personal reason. Two years after, I found myself to be at 198 lbs, I feel heavy again. I’m always catching my breath every time I climbed the stairs or walk in an uphill road. I started going back to fitness by joining the mountain bike trails (see my post on my first MTB ride). Only fitness for me at that time is to ride every Saturday and I have my own struggles in keeping up the pace. 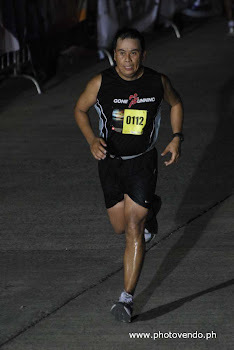 Then, one morning, an email in the office pop out addressed to all employees re the Condura Run, which was sponsored by our President’s brother (Ton Concepcion). Yes, I am connected with Concepcion Carrier Airconditioning Company managed by Raul Joseph Concepcion. First, I wanted to support the event for obvious reasons, secondly, I have never participated in a running event (except from my high school days), and I am excited to participate in one. Since I haven’t run for a long time, I decided to join the 5k run. One of my colleagues, Mike (a boxer and a body builder who has his own success story in fitness), will be running 10k so I figured, why not get a crack of the 10k and see for myself if I can finish it. I only have two weeks to prepare for the run, so I started running on weekdays. I have struggled to complete one lap in the village as I was gasping for air. But it did not stop me to continue. If I don’t prepare, then I will not achieve my goal. I invited my best friend Jay Chavez, and he then invited his wife (Noemi) and office mates (Ronald and Allan) to join the Condura Run. I told Jay that I will be running the 10k to see if I can make it, and he then agreed to run 10k so that all of us can experience it. We both believe that if we don’t try, we will forever ask the question “What would it be like to run 10k?” Then two days before the race, I was able to complete a 10k run in the village (well, mostly jog and some walk). It took me 80 minutes to finish that run, don’t know really what time is acceptable for that distance though, but I used that as a benchmark to start improving. A day before the race, Mike and I were still convincing some of our office mates to join the run. I’m happy that my team will be joining, some will run, others will cheer. It was indeed an exciting day for everyone, especially us who were first time to join the Condura run. The day finally came, had to wake up early, drove from Laguna to the Fort. Jay texting me that they were at the site already (and im still at the expressway). As expected, there was a huge crowd, a lot of runners both professionals and newbies like me. It was a good site to see and that gets me motivated to run as I see a lot of runners taking time for such an event. Then it was time to run.. I ran at my slow pace trying to reserve my energy just to make sure that I will finish the race and not quit. In the beginning I felt pressure as a lot of runners keep on passing by me and kept me thinking that I might be the last person to arrive the finish line. But after 2k, I just concentrated on my running and focused on my objective. It doesn’t matter whether im fast or slow, the point is that I’m enjoying it and that I will not quit even if I had to walk all the way to the finish line. As the expert says, it’s a mental game, just like any other sports. It was a good experience to join such an event, I managed to finish in 71 minutes better than the first run that I did. After the event, I started running again, and it has become a part of my routine. I joined my 2nd race which was the Greenfield run. I expect to join more races and hopefully improve my running skills further.